I'm currently reading Transcending CSS: The Fine Art of Web Design . In it I'm finding lots of good design tips, and learning many new HTML elements I've never heard of. The guy is really an excellent writer. This book is right up there with my other favorite The Zen of CSS Design: Visual Enlightenment for the Web . 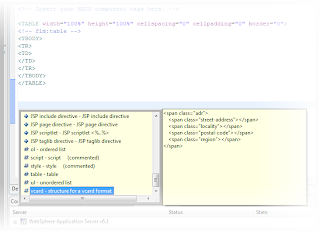 So since my brain is already overflowing with technobabble, I had the bright idea to use the Eclipse template feature (this allows you to press + and get a list of options as you are typing in your editor in case you did not know). That way, I am more likely to use the elements if I come across the opportunity in the future. A good example is marking up addresses in the h-card microformat. This makes it easier to consume this type of data in other services or devices (think email clients, feed readers, PIM applications, etc). It also start to get you thinking away from the pergatory of table based layouts. So , in Eclipse (or Rational Application Developer, Software Architect, Business Developer, RDi, RDz, WebSphere studio, Functional Tester, WebLogic Studio, or just about any eclipse based product), go to 'Window - Preferences". 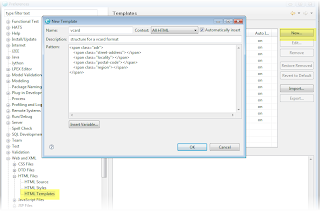 Then expand 'Web and XML' on the left hand side, then 'HTML', and select 'HTML Templates'. You can add in your html code chunks here. This is very handy for those of you that have been keeping a library of notepad scripts in various folders and sub folders. Now, if you are in a quandry of just how to style the content, once you've added this, then check out this guy's ideas. Eric Meyer also has quite few great ideas.